Pikmin 2 is the second game in the Pikmin series, released in 2004 for the GameCube. It takes place directly after the first game, which ended with Captain Olimar successfully escaping the planet of the Pikmin. Compared to the previous game, it includes a 2-Player Battle mode, has no day limit, and features three new types of Pikmin. Its sequel, Pikmin 3, was released nine years later. The game was also released as a remake for the Wii, under the title New Play Control! Pikmin 2. Upon returning to Hocotate after his adventure on the planet of the Pikmin, Captain Olimar meets up with his employer and a newly hired, supposedly inexperienced employee named Louie. Olimar learns that Hocotate Freight is massively in debt due to the loss of a shipment of golden Pikpik carrots, a situation brought about by Louie. Olimar's ship, the S.S. Dolphin, is consequently sold in order to repay some of the debt, despite this not being enough. Upon hearing this, Olimar drops a bottle cap in shock, brought back to Hocotate as a souvenir for his son. An old ship proceeds to absorb the bottle cap and values it at × 100, leading to the President then sending Olimar and Louie back to the Pikmin planet, in order to retrieve treasure that can repay the company debt. Their goal is to repay the × 10000 of debt remaining. Whilst landing, they come across a small blizzard on the Valley of Repose. While trying to maneuver through some tree branches, Olimar hits one of them, which knocks Louie off of his cockpit and into the area below. The ship with Olimar inside manages to drop with a thud, ejecting the leader to the ground. He gets up and discovers some Red Pikmin fighting a Dwarf Red Bulborb. He tries to whistle them to his side, and helps them defeat the enemy when he realizes that they obey him still. With the Pikmin's help, Olimar and Louie, both in different parts of the area, manage to reunite and recover a treasure, the Courage Reactor, from Louie's side. During the following days, Olimar and Louie enter a cave in the area and discover Purple Pikmin inside. With their help, they gather a treasure that allows them to travel to a new area, the Spherical Atlas. On this area, the Awakening Wood, they find White Pikmin, and gather a new treasure which provides access to the Perplexing Pool. Between the three areas, the two leaders gather treasure, explore caves, and discover Yellow and Blue Pikmin. Eventually, Hocotate Freight's debt is repaid, at which point, the duo triumphantly returns to their home planet. On the way, however, Olimar discovers that Louie was left behind. When he meets up with the President, he notifies him about the fact that there are still more treasures available. The President gleefully tries to command Olimar and Louie to go back and gather more goods, until he realizes that Louie is not around. He chooses to take his place instead. At this point, the final area is unlocked: the Wistful Wild. In it, they manage to find Louie on the Dream Den, atop a Titan Dweevil. They save him, and at their own pace, they eventually manage to clear the areas of all treasure. This game has two endings, and they can be both obtained in the same playthrough. The first ending occurs when the debt is repaid, while the second happens when all treasures are collected. It is not quite clear which ending is the canon one, or if the plot line even includes a Pikmin 2 ending to begin with. The events of Pikmin 3 involving the Hocotatians and their backstory fit in with any scenario on Pikmin 2, except for the case in which the debt is repaid, but Louie is not rescued from the Dream Den. The gameplay of Pikmin 2 is similar to the series' first game, with a few changes. For example, / no longer opens up the map of the current area; instead, it is accessed via / . The previous button is now used to switch control between the two currently available leaders, introducing a multitasking aspect. Unlike the first game, this one has an endless amount of days in which to complete all objectives. At the end of a day, the nocturnal enemies of the planet awaken, posing an impossible threat, and any Pikmin left behind are killed. After the ship has risen into a low orbit, it is possible to view the treasures salvaged that day, the current Pikmin count, and any mail sent by various characters. There are two new hazards introduced in Pikmin 2: electricity and poison. The majority of obstacles are present again, along with new ones, such as electric gates and paper bags. Red, Yellow and Blue Pikmin are stored in Onions, while Purples and Whites are stored in the ship's hull, due to their production being through appropriate Candypop Buds, thus having no respective Onions. Other additions to this game include sprays and treasures that provide upgrades. Main article: Challenge Mode in Pikmin 2. The Challenge Mode is also considerably different compared to the one in the previous game. Instead of having one day to raise as many Pikmin as possible, players are tasked to get out of the cave via the geyser on the last floor, but in order to open the geyser or the hole to a following sublevel, The Key must be delivered to the research pod. The player's score is calculated based on several factors, such as the time they took, and the number of Pokos won. In 2-Player battle, two players control one leader each, and must fight against each other using their own army of Pikmin. The gameplay rules are the same as in any other mode, but with the combat aspect to it, and the ability to recover cherries that give the player an item to use in-battle. The Japanese version of Pikmin 2 features e-Reader compatibility. Sets of Pikmin e-Reader cards were sold, which unlocked new mini-games. This feature was not available in other regions, because the peripheral had been discontinued. The option on the bonuses menu of these versions was removed (though it is still accessible through hacking and will work with a Japanese e-Reader). When the e-cards were first announced for Pikmin 2, many people thought it was an announcement for a Game Boy Advance version of Pikmin 2. Purple Pikmin are the first underground Pikmin and the second kind of Pikmin discovered in the game. They are found by using the Violet Candypop Buds in the last sublevel of the Emergence Cave. They have a bulky appearance and have visible hairs on their head. Purple Pikmin are needed to carry the heavy Spherical Atlas in the cave, because Purples have 10 times the strength of an ordinary Pikmin. Their great weight means that they shake the ground upon landing from a throw, which can temporarily stun nearby enemies of most species that are on the ground. Purples are also the strongest type of Pikmin, dealing the most damage in attacking enemies. They possess an advantage over other Pikmin when dealing with some bosses: for example, they can harm Giant Breadbugs and can make a Waterwraith vulnerable to attack by any Pikmin. White Pikmin are the second underground Pikmin and third type of Pikmin found in Pikmin 2. To find the game's first White Pikmin, the player must visit the White Flower Garden and progress to sublevel three, where the Ivory Candypop Buds are. They are smaller than other Pikmin and have red eyes. The poison clouds produced by poison pipes and Doodlebugs will cause any other Pikmin to choke, but White Pikmin are immune to them. These Pikmin can locate buried items on their own, making them essential for unearthing buried treasure. They are also the fastest of the Pikmin, both in terms of carrying items and keeping up with the leader. When eaten by an enemy, they poison their foe and cause it to lose some health; smaller enemies are killed instantly. The downside is their weaker attack strength. Bulbmin are the last type of Pikmin the player may find. They are found in three caves: Submerged Castle, Frontier Cavern and Hole of Heroes. Bulbmin may look like Bulborbs, but they can be used like, and act similarly to, any other Pikmin. To retrieve small Bulbmin, one must defeat the larger Bulbmin and then call the small ones with a leader's whistle. Bulbmin are immune to all the hazards on the planet except physical threats posed by enemies, but can't leave underground areas, making them a good choice to use in Candypop Buds. Valley of Repose: A snowy valley in which Captain Olimar and Louie first land. They discover Red Pikmin and Purple Pikmin here. Awakening Wood: A small forest filled with Grub-dogs; it is where Olimar and Louie first discover White Pikmin and Blue Pikmin. Unlocked with the Spherical Atlas. Perplexing Pool: An aquatic area with many enemies native to water. The leaders find Yellow Pikmin here. Unlocked with the Geographic Projection. Wistful Wild: An autumn forest native to many tough beasts. This area is opened after the debt is repaid. Treasures are the main collectible in Pikmin 2. Each treasure helps repay the debt, and they have varying sizes, weights, and values. Enemies can also serve as a source of money, albeit minimal. Most of the objects considered treasure by the Hocotatians are everyday objects in the real world. The enemies in this game are more varied than the ones in the previous one, and more of them make use of hazards to hurt the Pikmin with. There are more types of plant and fungus in Pikmin 2, but they are still mostly decorative. Some of them have their own Piklopedia entry. Players control a leader with the GameCube controller. It is possible to swap between the two leaders, provided they're both conscious. Players can also control the camera to a degree, as well as issue basic commands to their Pikmin, which in turn, perform whatever complex task is necessary. Pikmin 2 has been re-released as part of the New Play Control! series of games for the Wii in Japan, Europe, Australia and North America. The game incorporates the Wii's controller's capabilities to allow aiming the cursor by pointing, as well as graphical enhancements and an updated save system. The Japanese version of the game is only available in Japanese, while the American version is available in American English, American Spanish, and Canadian French, and the European version of the game is available in American English (though the Magical Stage's sales pitch is in European English), European French, German, Italian, and European Spanish. Main articles: Region and New Play Control! Pikmin 2. The first version of Pikmin 2 to release was the Japanese GameCube version. Later, the game was localized for and released in North America, and later still, the same happened for Europe and Oceania. All three of these count as different versions, and contain notable changes from one another. Besides the Japanese version using Japanese text, the North American version using English text, and the European version using European-language texts, the biggest difference between all of these versions is the list of treasures. A majority of the treasures are the same everywhere, but a handful of them were changed entirely to better suit each region's player-base. Other, minor versions also exist between all of these versions. In 2009, a Wii remake of this game was released, titled New Play Control! Pikmin 2. This remake has some notable differences, with the most important one being the different control scheme. Japan, North America, and Europe/Oceania each got a different version of New Play Control! Pikmin 2, with changes very similar to the ones between the GameCube releases. Pikmin 2, has some of the best scores of any Pikmin game. It was applauded for the removal of the 30-day limit, which was not well received by some players. It scored 89.44% on GameRankings, and 90/100 on Metacritic. Pikmin 2's plot takes place directly after Pikmin's events, and Olimar's first encounter with the Pikmin from that game is referenced. Besides that, the game explains everything about the canon on its own. See also: Pikmin 2 promotional material. North American Player's Choice boxart. Artwork used on the North American box art. North American Nintendo Selects boxart. In the Wii game WarioWare: Smooth Moves there is a mini-game based on and called "Pikmin 2". In it, the player controls an Empress Bulblax and must use the Wii Remote to roll it from side to side squishing Pikmin. 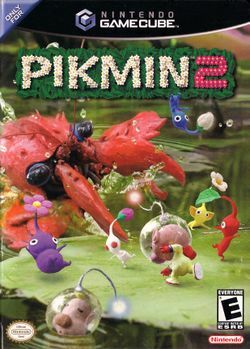 On the European boxart for Pikmin 2, one can faintly see a Red Bulborb in the background. The GameCube flavor text is "Find your fortune with the help of all-new Pikmin!". This page was last edited on March 16, 2019, at 10:29.